As with my English football roundup, I am going to start with the game that was the worst for me, since it saw the team I support eliminated from the playoffs. Being a fan of a club or franchise can be an up and down experience, but having two rooting interests in different sports at the same time can multiply that experience on any given weekend. In terms of longevity, Tottenham of course rank as team I have supported the longest, for as far back as I can remember in starting around 1985 when I was 4; then comes the Green Bay Packers, who I adopted in the early 1990s when the UK television Channel 4 showed the Saturday morning roundup show called “Blitz” and I picked this team from a place called Wisconsin (even living in the USA now and having been to 32 of the 50 states, I still have not made it to the Beaver State) where they liked cheese and had a highly-touted young quarterback called Brett Favre; and then the New York Yankees, who I rooted for as they were the underdogs in the 1996 World Series – my introduction to baseball – and there home city was a place I was interested in visiting and subsequently living in, rather than Atlanta. Anyway – and I really am going to get back to the 49ers victory in a moment – in the weekend between Christmas and New Year’s, Tottenham beat Stoke 3-0, then won at Old Trafford against Manchester United, while the Packers had Aaron Rodgers return and beat the Bears in Chicago to advance to the playoffs. That was a good week for me as a sports fan. However, last Saturday, Spurs were beaten by their arch-rivals, Arsenal and knocked out of the FA Cup in the first round they played in, which made the signs look ominous for Green Bay, even though the two contests to others may have appeared completely unrelated. At the start of the game against San Francisco, the Packers lived up to my diminished expectations by failing to get a first down in the first quarter and were lucky to have escaped two trips to the red zones by the 49ers with only a six point deficit. However, after that things started to pick up and even though they trailed at half-time, Green Bay were finally looking like they could not only contain Colin Kaerpernick for the first time in three attempts, they were also starting to move the ball and Rodgers was looking more like himself. Midway through the second-half, the Packers QB made an incredible play, alluding two San Francisco defenders who looked like they were about the sack him on fourth down, then found Randall Cobb downfield. That play setup a go-ahead touchdown, carried into the end zone by full-back John Kuhn, who completely failed to make the Lambeau Leap, not even getting off the floor. 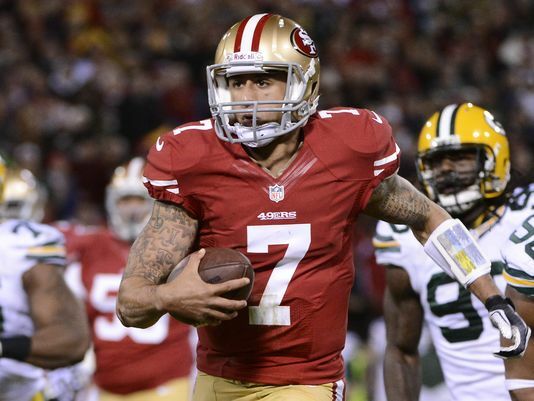 However, Kaepernick quickly had the visiting team in the lead again as he led the 49ers down the field and threw a 28 yard touchdown pass to Vernon Davis and, when the Packers could then only tie the score with a field goal on their next possession, San Francisco controlled the ball for the last five and a half minutes and a Phil Dawson kick as time expired put them through to the divisional round. During that final drive, there was a pass that should have been picked off by Micah Hyde, but the Green Bay cornerback dropped it and at that point, I knew the Packers had lost. I watched this matchup in Croxley Ales on the Lower East Side – a playoff tradition with a group of friends that dates back to us watching the Packers vs Giants NFC Championship game in 2008 – so as much of my attention was on the awesome hot wings and beer selection on offer, as was on the game. However, I could not fail to register the complete reversal of fortunes the two teams were going through in the second half thanks to a Chiefs fan in a Jamaal Charles jersey at the next table who was standing up first celebrating, then in sheer disbelief as Kansas City gave up a 38-10 lead to lose 45-44. While Alex Smith had a great performance for the Chiefs, throwing four touchdowns and no interceptions – though he did give up a fumble during the collapse – it was a tale of two halves for Andrew Luck, who gave up three picks in the first half, but rallied to end with four TD passes (three in the second half) and had a crucial play when he recovered a loose ball and dived over the line to bring the Colts to within three points in the fourth quarter. It was the largest comeback in NFL playoff history that did not require overtime – the Bills recovered from 32 points down to beat the Houston Oilers in an extra period in January 1993 – and was the eighth time in his young career that Luck has led Indianapolis to a come-from-behind victory in the fourth quarter. During the first half of this matchup, it appeared that the narrative that had been touted all week about the Saints – that they could not win on the road – was going to prove true as they put up only six points and Drew Brees threw two interceptions. However, New Orleans’ defence held Philadelphia to just 7 points through those first thirty minutes and Brees – who was Super Bowl MVP when he led the team to victory in February 2010 – had a much stronger performance in the third quarter as he led two touchdown drives to move the Saints into the lead. Nick Foles, who had an impressive season when he became the starter for the Eagles, did get his team back in front with a 3 yard pass to Zach Ertz inside the final five minutes, but a Shayne Graham kick as time expired gave the Saints their first road playoff victory in franchise history. With the other three games being decided by a total of six points, this was the game that was considerably less exciting and the one that I watched least of – Andy Dalton will be hoping that many more people did the same. A week after the Cincinnati QB had turned the ball over four times, he did so three more times with two interceptions and a lost fumble that saw the Bengals extend their winless playoff streak that dates back to 1990. As for the Chargers – who, as many football pundits have been mentioning all week, would not have even been in the playoffs had it not been for a missed field goal (and non-call by the refs on that play) in their final fixture of the regular season against the Chiefs – they now have momentum having won their last five, the longest streak in the AFC.